The walls are made of windows in the building where I work, so one of my favorite pastimes when clients aren’t coming in is to people watch as students rush by, hurrying to their next class. This is what I was doing early this morning before we opened. I saw this girl walk by, and I was instantly captivated by her personhood. She had long, blonde/pink hair, a Pinterest perfect fall outfit, a hipster beanie, and a super cute backpack. I turned to my friend Lucy and said, “she is the personification of everything I strive to be.” But the more I think about that statement, the less I believe myself. I know nothing of that girl’s spiritual life, academic achievement, campus and community involvement, dedication to friendship, or anything else that truly matters. There is no denying that whoever she is, the girl has style, but when I evaluate my goals, that is not what I strive to have. I strive for spiritual maturity in my walk with Christ. I strive to graduate with a 4.0 gpa and be accepted into a top graduate program. I strive to make a difference in the lives of the students around me. I strive to be a source of unconditional love for my friends and family. Looking cute is fun, and it might gain me followers on Instagram and WordPress, but allowing God to use me by investing in the lives of the youth in my church will help me grow and mature spiritually. 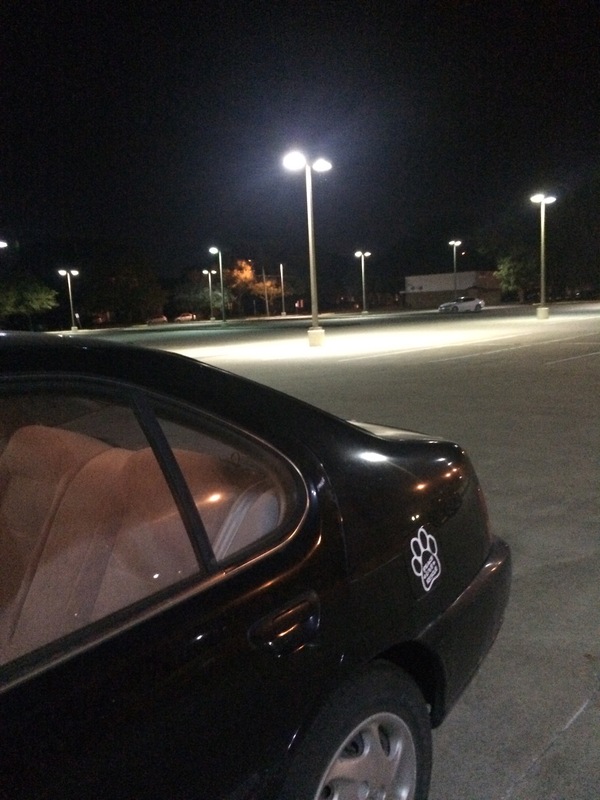 Being the last person in the library parking lot will help me achieve my academic goals. Spending quality time with my friends will deepen and strengthen our relationships. 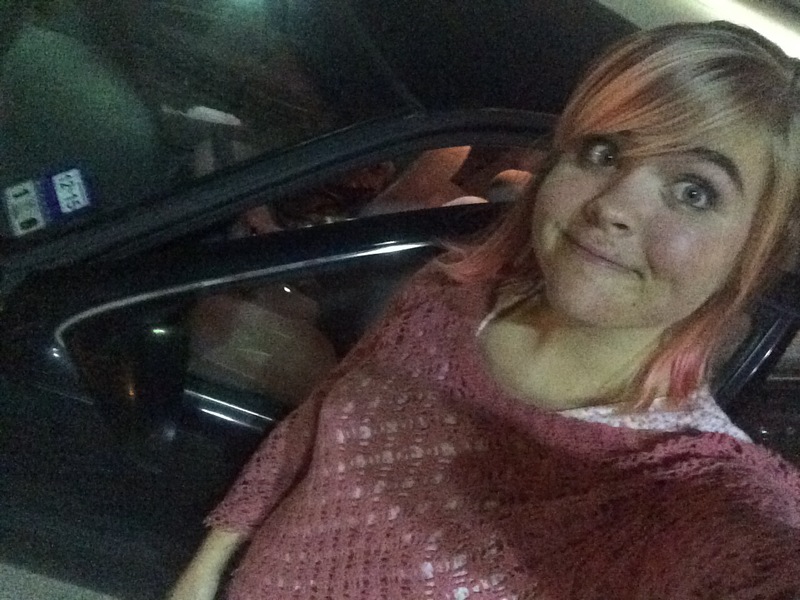 Sometimes I think I need a reminder that my external appearance is one itty bitty fraction of who I am as a person. That’s part of the reason I love the ODP so much; the depth of emotions that comes from wearing the same dress every single day for an entire month is what brings me back to this project each year. Creatively pairing articles of clothing into outfits I’d never dream of wearing in any other month is exciting, but the yearly mental reset into an attitude of thankfulness and contentment is the real treasure of the ODP. You are adorable, and someday I hope to ask you where you got your backpack. I think we could be great friends, and I’m always down for more friends. But you are not everything I strive to be, because I strive to be more like Jesus. Ps: let’s get coffee sometime, because I’m serious about the backpack thing. Don’t those look pretty? My mom and I made this for my birthday this past year. It all started with a cake. 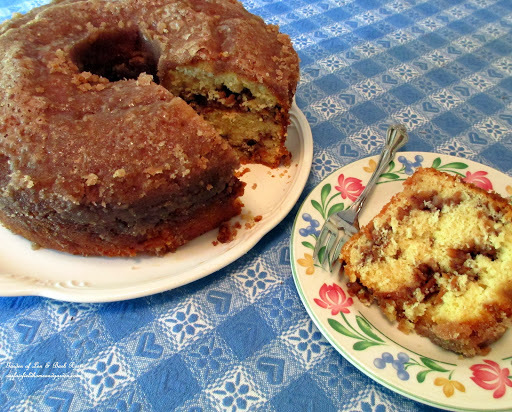 I wanted to make this delicious sounding cake that I saw on Pinterest (of course, right?). I mixed up the batter, baked it, let it cool, popped it out of the pan, and it broke straight in two. Right before I had to go to work, so I couldn’t try again… So my mom took over. And the same thing happened to her. So now we had two delicious, yet broken, cakes. The day before my birthday. So what do you do with broken cake? 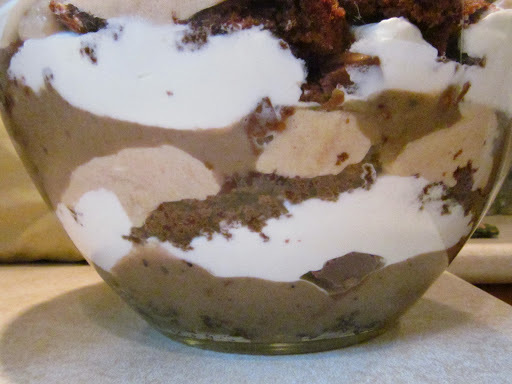 You make it into trifle, of course! 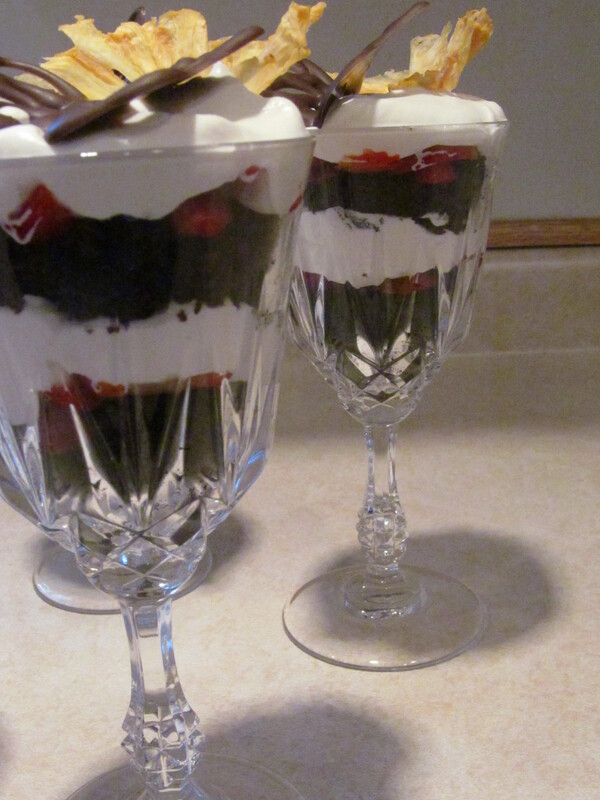 And you can’t just make a normal trifle for your own 18th birthday, so I had to do something cool to decorate them. Re-enter Pinterest! You’d think I’d have learned not to trust Pinterest the day before things have to be done, but I haven’t yet. The second time time, it was definitely a pin-win, not a pinstrosity. I had seen these pineapple flowers pop up several times and wanted to try them for a while, and this seemed to be the perfect opportunity. It was really simple: slice your pineapple into extremely thin slices, lay them out on a cookie sheet, and bake at 225 degrees for 30 minutes at a time, flipping them over after each 30 minutes. Depending on how thin you slice your pineapple, baking time can vary from about 1-2 hours. When they seem thoroughly dried out, place each slice in a muffin tin (mine went into mini muffin tins because I wanted more of a curve) and let them sit over night. This will make the shape of the flower. 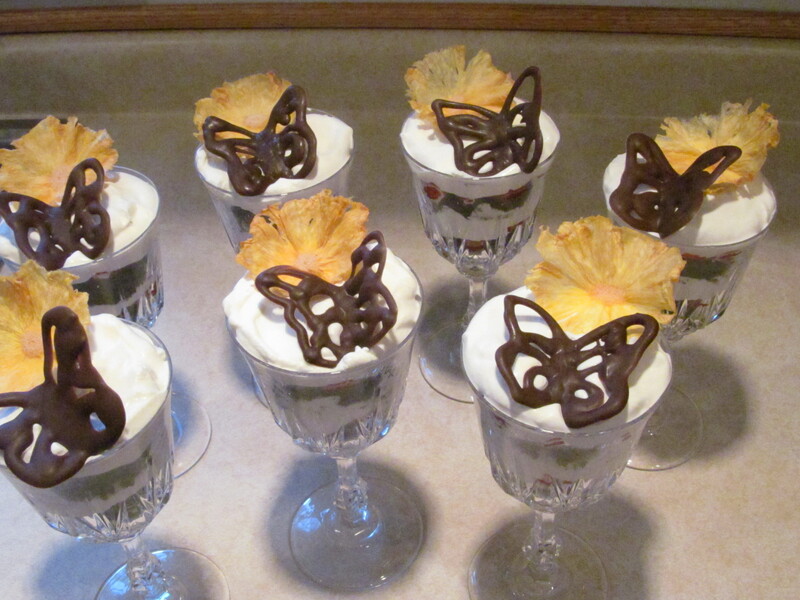 The next step to fancy up my trifles was chocolate butterflies. 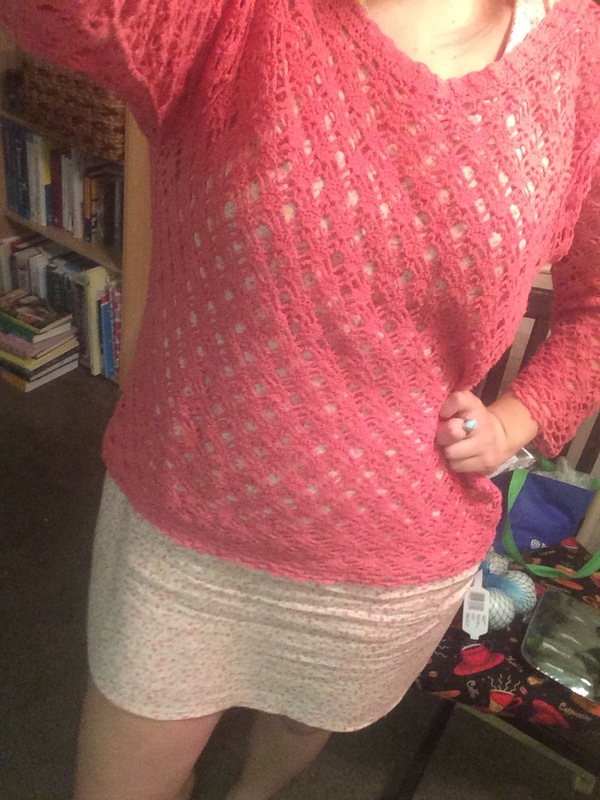 I had made these before, and I think I put them on the blog, but I’ll recap for you here. They’re super easy to do! The most important thing is DO NOT USE CHOCOLATE CHIPS! 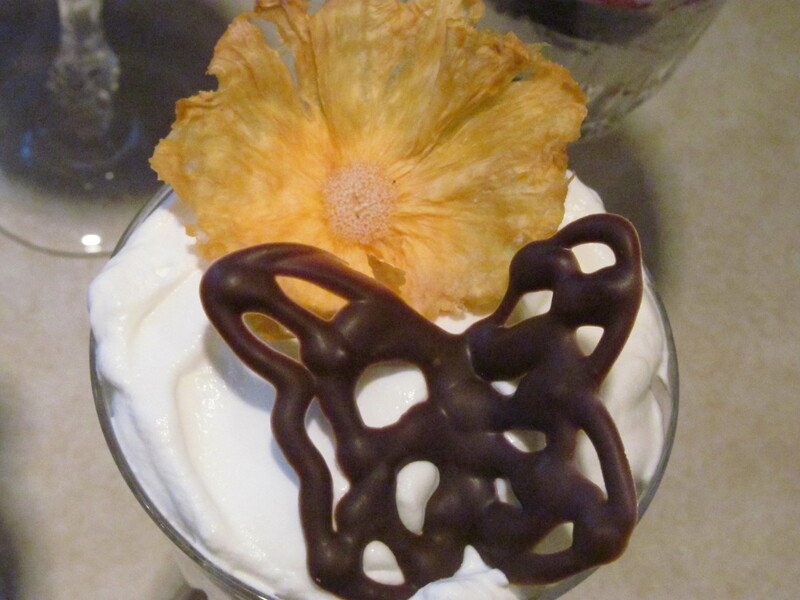 The first time I made these I disregarded that rule, and my butterflies turned out extremely lumpy and fragile. Use almond bark. 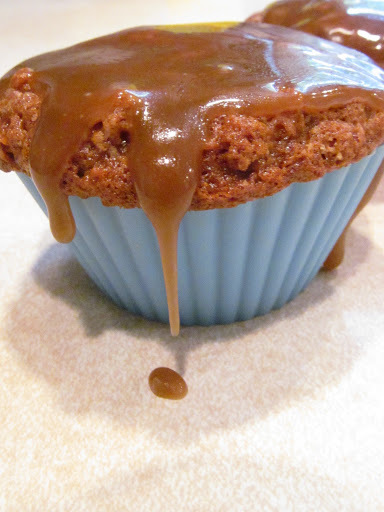 It is much smoother when it melts, and it keeps its shape much better when it cools. Print (or draw) a butterfly design in a couple different sizes. Lay wax paper over your paper designs. Melt your almond bark in a double boiler (or in 30 second intervals in the microwave) and let cool until it’s hardened just a teeny bit. If you try to pipe it too soon it runs everywhere and doesn’t form a butterfly, but if you let it cool too much then it is difficult to pipe. 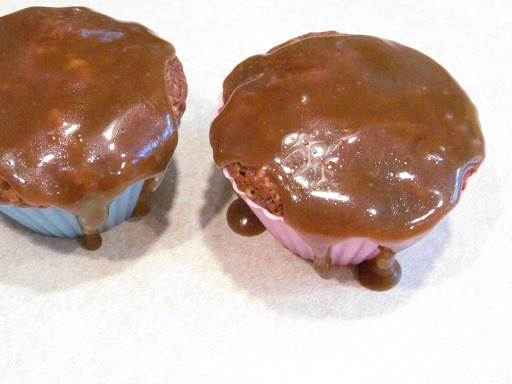 Pour the chocolate into an icing bag (if you don’t have one, you can use a ziplock with one small corner snipped out. Pipe the chocolate over the designs carefully. When you have as many butterflies as you want (I suggest making extra ones in case some break or don’t turn out as well) carefully set the wax paper on an open book, with the butterfly’s spine in the middle of the book’s spine. This will create the arch of the wings. Set the books in the fridge and let chill overnight. 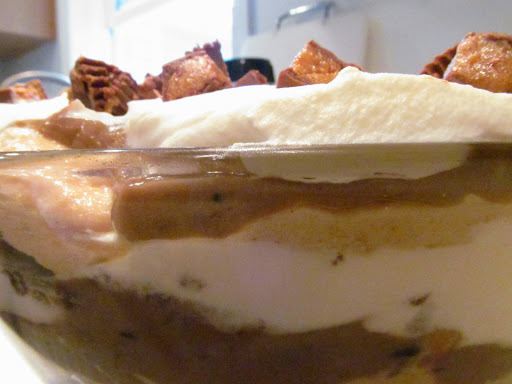 The next morning you can assemble your trifles! I layered my cake with whipped cream and strawberries, with a pineapple f’lower and a chocolate butterfly on each one. I would say they were a hit, even if creating them was a bit more of an adventure than I anticipated! Enjoy! If you have a Pinterest account and are remotely interested in food, you’ve probably seen this pin. It has gone totally viral the past few weeks. So I thought, it’s apple season, this pin is popular, I might as well try it out, right? Right. It was pretty delicious. Unfortunately, I left mine in the pan a little too long and it broke apart instead of being beautiful like the original photo above (from the original website). But it still tasted delicious! Also: I think it’s pretty safe to say I use a lot of cinnamon.. Today my mom bought Cinnamon at Sam’s Club, which means it’s a ginormous container. When I asked why she bought so much she informed me that I’ve used an entire little container of cinnamon ever month for the past four months. Some things you just have to buy in bulk! If you don’t have one of these, you should invest at once. They’re amazing. Especially at Thanksgiving when you’re making apple pie and apple crisp and apple cider etc, etc, etc. 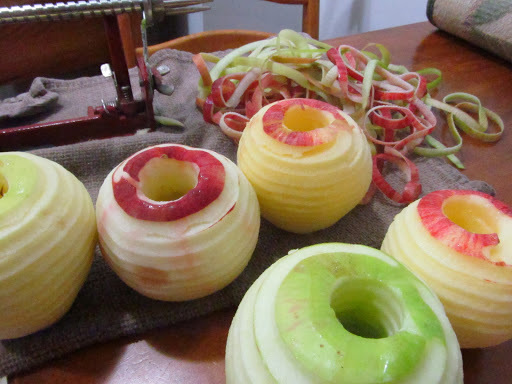 It literally takes 10 seconds to peel and core your apples this way. 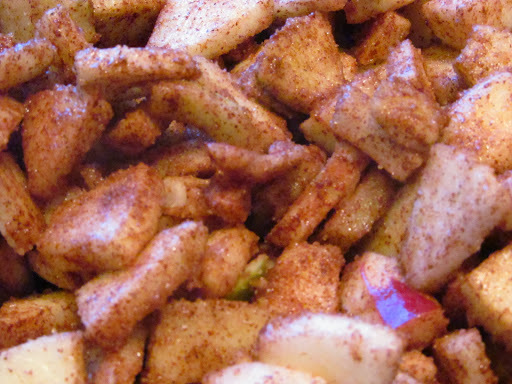 You’ll need 5 medium size apples for this recipe, peeled, cored, and diced. Cover them with the cinnamon and sugar and set overnight. I didn’t read the recipe before starting, so I didn’t really want to wait overnight to make the cake. If that’s the case with you as well, you can do it the cheater way like me.. I just spread them in the bottom of a 9×13 pan and baked them at the lowest setting of my oven for about 10-15 minutes. 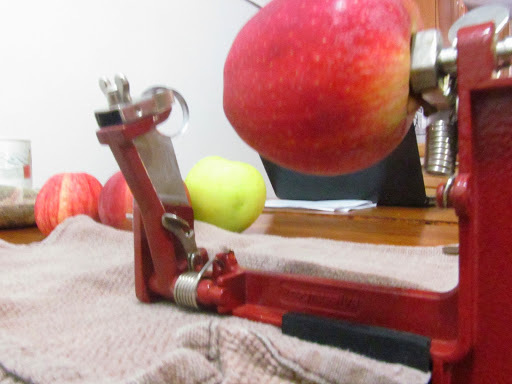 The purpose of them sitting out was to allow the sugar to break down the apples a little to make them extra juicy, and so baking them accomplishes a similar effect in less than half an hour. Preheat your oven to 350 degrees. 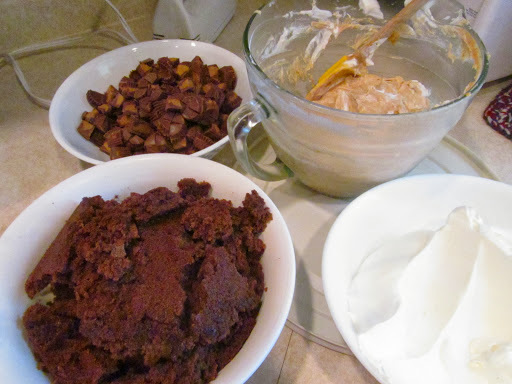 Mix the dry ingredients, minus the sugar, together. Mix the wet ingredients, plus the sugar, together. 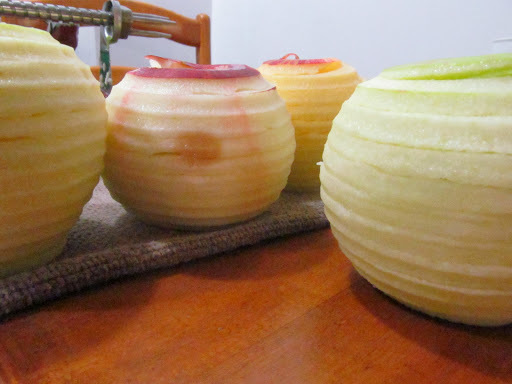 (keeping the apples separate). Combine the two until well mixed. Layer the apples and cake batter in a greased tube pan. Bake at 350 for 1 1/2 hours. While it is baking heat the topping over medium heat in a small saucepan until bubbling. Set aside. When the cake has finished baking pour the topping over it and leave it in the warm oven for 5 minutes. This will form a hard sugary coating that is totally delicious. Enjoy! 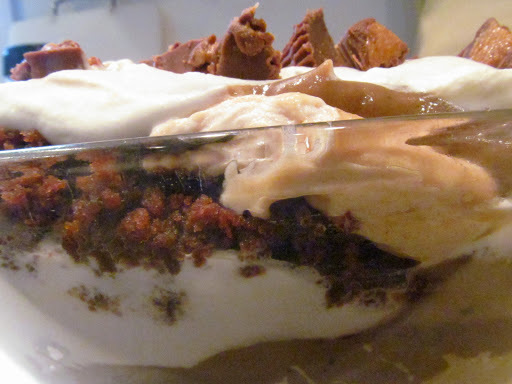 The layers are composed of brownies, whipped cream, a sweet peanut butter mixture, pudding, and Reese’s. I kept forgetting the layers while I was at the store and I couldn’t get the recipe back because I had terrible service, so I just guessed on what flavor pudding. I guessed vanilla, but it was supposed to be chocolate so I just added cocoa to the vanilla mix and it worked out just fine. It’s so pretty layered too! 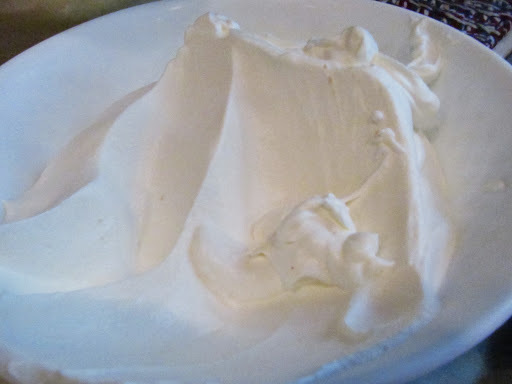 Beat the heavy cream in an electric mixer until stiff peaks form. Transfer to a medium bowl and chill. 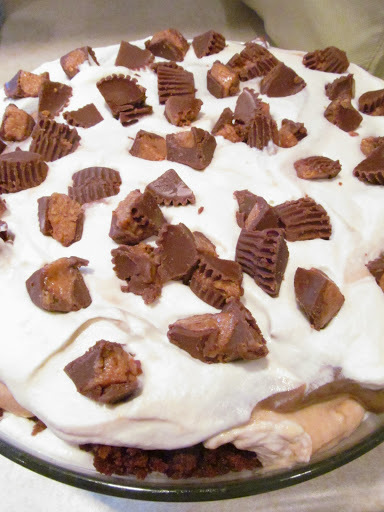 In the bowl the cream was whipped in mix the peanut butter and cream cheese together until well combined. Add the powdered sugar and milk. 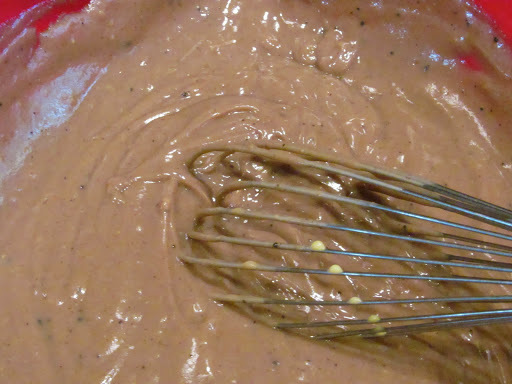 Fold 1 C of the whipped cream into the peanut butter mixture until it is a lighter color and mostly combined. Layer however you like and enjoy! These cupcakes are incredible. There’s no other way to describe them. SO GOOD. The best apple flavored food you’ll ever eat. I’m not even exaggerating. For reals. I made them the other day for a church dinner and they were a huge hit! I found them on Pinterest, but the recipe was on the picture and didn’t connect to a blog so I’ll just copy the recipe here. Makes 12 cupcakes. Preheat oven to 350. Mix together all the dry ingredients. In a separate bowl cream together sugar, egg, and oil. Mix the wet and dry ingredients until just combined. Add the apples and mix thoroughly. The batter will be really thick, so you’ll want to mix the apples so they let off some of their juice. 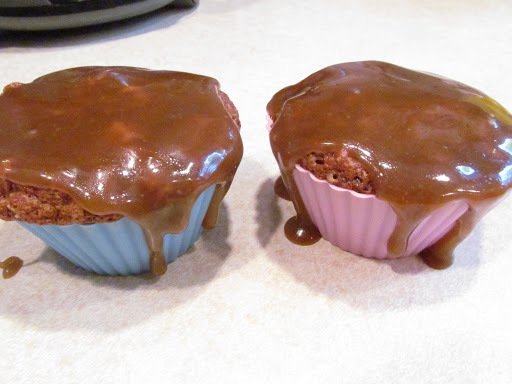 Scoop into baking cups and bake at 350 for 30 minutes. While the cupcakes are baking prepare the icing. In a small saucepan melt the butter and heavy cream on medium heat. Add the brown sugar and bowl for 5 minutes. Remove from heat and add vanilla. Let cool. 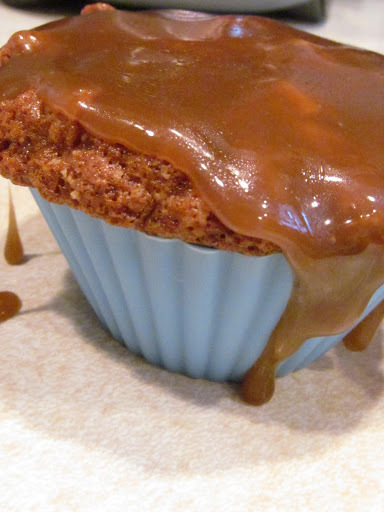 Drizzle over cooled cupcakes and enjoy! P.S. This is my 150th post! Crazy, right?? So I definitely thought that this week’s “It’s Just Lunch” was going to be a dud. But luckily for me, it wasn’t! They were absolutely delicious! Way better than bagels you would get from the store, and way less expensive! I was originally going to make these bagels for breakfast this morning and post them separately from “It’s Just Lunch,” but then I realized I still didn’t have a post for this week so I’d better post these! And it worked out because they weren’t done until noon anyway! If you do decide to make them, I would suggest starting the dough the night before, because it has to rise a while. The one on the left was sprinkled with poppyseeds. This one was flavored with basil and oregano. The one in the middle is flavored with minced onion and garlic. Sprinkle the yeast and sugar over 1/2 C warm water, but do not stir. Let sit for 5 minutes until frothy. While that is sitting mix the flour and salt in a stand mixer with the bread hook attachment. You can also do it in a large bowl with a spatula if you don’t have a bread hook (but if you make a lot of bread they’re definitely worth the investment). Make a well in the middle of the flour and pour in the yeast mixture and another 1/2 C warm water. Mix together until moist and dense. Add the other 1/2 C warm water 1 T at a time, just until all the flour is incorporated and the dough is slightly moist. Knead by hand for 10 minutes. Put the dough in a lightly oiled bowl and place a damp tea towel over it. Let it raise for 1 hour or until doubled in size. The best place for bread to rise is somewhere warm, so I just put mine in the oven at the lowest heat (mine only goes down to 170 degrees) with a small bowl of water under it. After the dough has doubled in size punch it down and let it rise an additional 15 minutes. Preheat your oven to 430 degrees and put a large pot of water on the stove to boil. Take out the dough and separate it into 8 equal parts. Mold your dough into discs by pressing them down on the counter. Poke a hole through the middle and stretch the hole out until it’s about 1/3 the size of the bagel. (this isn’t as hard as it sounds, just make it into a bagel shape) When your water is boiling float as many bagels will fit in the pot. Boil them for 1-2 minutes on each side (the longer you boil them the chewier they will be). After they have boiled you can add any toppings you like. If you want to add bigger spices or minced onion I would suggest adding it to an egg wash so it doesn’t fall off when you bake it. Bake at 430 for 20 minutes. Enjoy! This weeks It’s Just Lunch is SUPER easy! I’ve been wanting to try making cornbread in the waffle maker for a while now, but we’ve never had chili for me to put on it until now. We made chili for our church’s dinner and had a little left over for me to use.